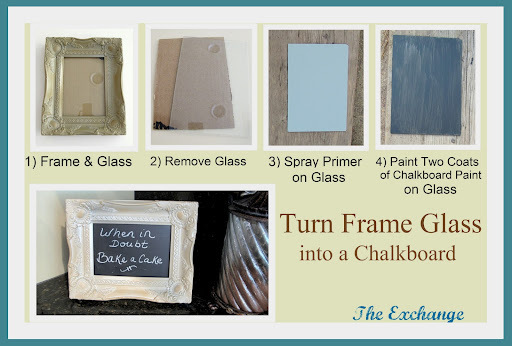 I have been painting glass for years for various projects and it hit me the other day (as I was having trouble finding chalkboards to fit my various size frames), why not paint the existing glass in my frames with chalkboard paint? Well, it worked perfectly and is so easy and I now know what everybody is getting for Christmas! 2) With an oven mitt on your hand to protect from being cut, clean your glass with glass cleaner or alcohol. 4) The primer must completely dry otherwise the chalkboard paint will not work. I always allow at least two hours. This project would make a great gift! Think about making one of these in a small counter frame with a quote or “Happy Birthday” written on the board and wrap it in cellophane with a pretty bow and give it to a girlfriend or sister with two sticks of chalk. For Christmas, I’m going to make several larger frames and write “Joy” or “Noel” in red chalk and wrap in cellophane and give as gifts. There are a lot of endless possibilities here! Well that’s it for now. 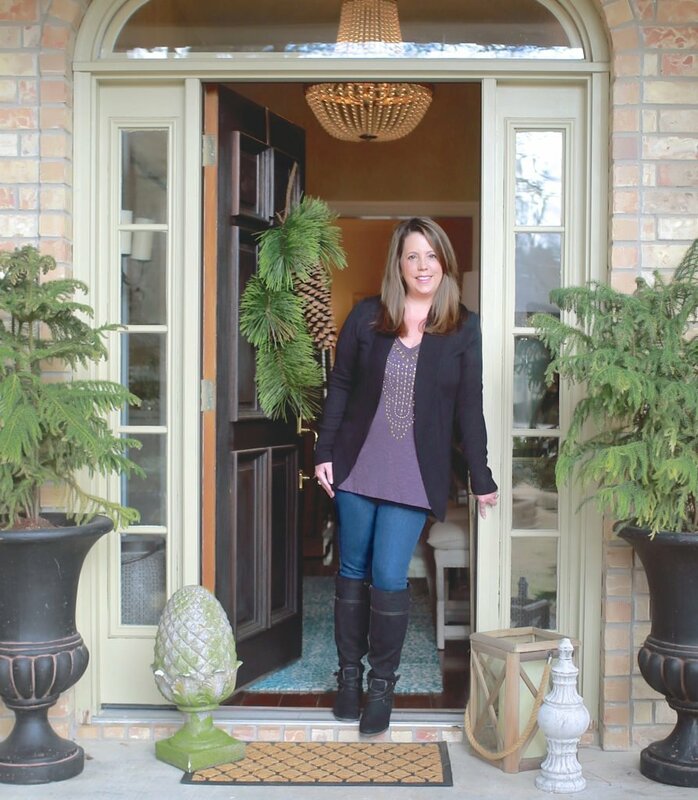 I have been working on revamping my entry way and hope to have it all finished by next week and will be posting the project. I also have several other fun projects almost ready for you, so check back soon. As always, thank you, thank you for your sweet comments, emails and notes! You all just warm my heart and I can’t thank you enough for your kind encouragement and feedback. I laughed so hard reading all of your hysterical comments about being “Cricut-less” on the the vinyl letters and monogram post last week. « Create Vinyl Monograms WITHOUT a Machine! Can I do this with a mirror too? Hope so! Thanks for the idea! Fantastic! Do you think it would work with the spray can chalk board paint? I have some on hand. Yes, it should work with a mirror, same technique. Shannon, I would think it would work with spray chalkboard paint and I even thought about that myself but had a can already. It may even be better with spray chalk paint. I would LOVE to know! Please let me know if you do it. Love this!!!! Definitely going to do it – so easy!! Thanks for sharing the steps and ideas. Wow! You are a genius! I love this! Thank you so much for sharing! 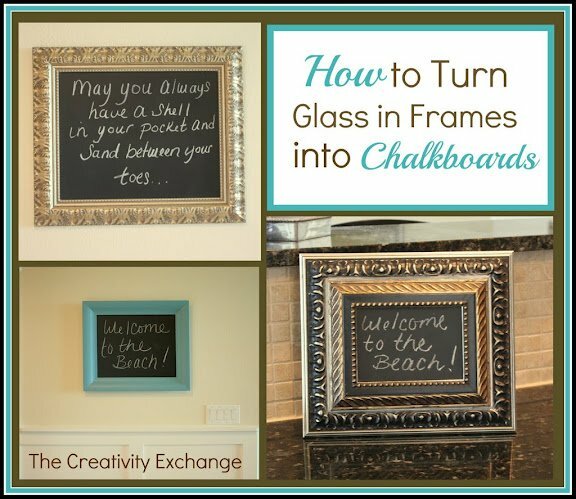 They looks great….I was wondering how chalkboard paint holds up on glass, when I used it on my glass kitchen canisters I used etching creme. So easy and cute! Thanks for the inspiration. I'll definitely be using this for our new office/homework room redo. Love this! What kind of primer did you use? Have you discovered Chalkboard Vinyl yet? It's basically just like contact paper (sticky on the back) with chalkboard finish on the front! I cut a piece of it in the size of frame I was using and removed the glass. Same concept, no paint! Liz, I always use Rustoleum Professional. It's a little more expensive but it has an extremely smooth finish (unlike most spray primers), I do not have to use as much and it works for everything! Thanks ladies! Yes, I have discovered chalkboard vinyl and that is a great suggestion if you want to avoid painting. Thanks for sharing Angela! I just got a big frame with glass from a garage sale, and really wanted to make a chalk board. Literally 5 minutes ago I was wondering if I need to buy some kind of thin wood to place in the frame and was getting discouraged at the prospect, hoping though that there's an easier way. Then I sat down to link one of my projects to Tatertots and Jello Weekend Wrap-up party and was looking through the list of projects and found YOURS. Soooo excited. Definitely doing that tomorrow! Thank you for sharing the tutorial. Cute blog. Now following you! 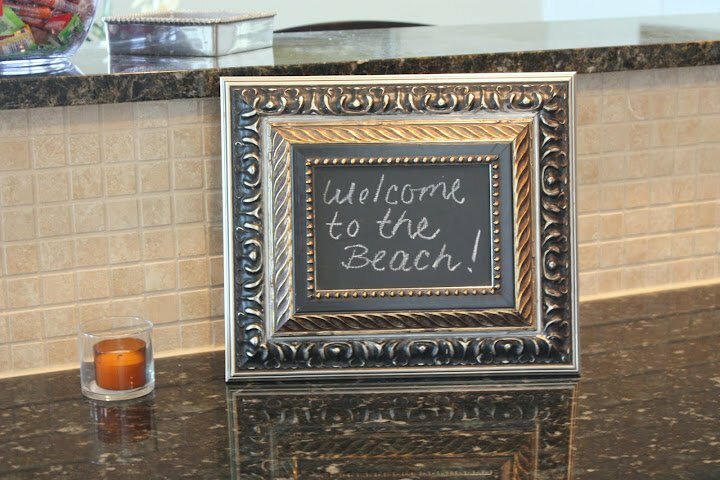 I'm sharing this link with a friend who wanted to paint some glass plates with chalkboard paint. Thanks for the tip. What a creative shortcut! Thanks for the tip! I would be delighted if you would link up to Potpourri Friday (in progress) plus a giveaway! That's a pretty neat creation! It beats the dry erase board in appeal for sure! I am so doing this.. this is such a creative and brilliant idea.. This is perfect for those of us with design ADD. I can go from quotes to simple art in a flash. My husband will love it. I'm giving the feather design a try today. Will likely put it in my foyer. I love this idea! Its a perfect gift idea for my 12-year old niece … teenagers (or almost teenagers, I should say) are always so hard to shop for. She will LOVE this! 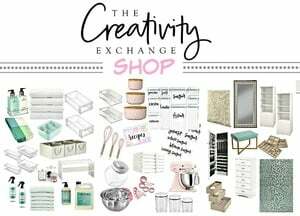 I love this idea and want to do it for gifts! Is the glass sturdy enough to survive being written on? I'm afraid the glass might break. Does anyone have any cute ideas on how to wrap these? I just made up a bunch of these this weekend for Christmas gifts and I’m at a loss on cute ideas! I was thinking that I was going to simply wrap them with clear cellophane and a fun bow. I was going to attach a mini chalkboard eraser and two pieces of chalk to the bow. Hope that helps! So glad that you made them, they are so fun to make! 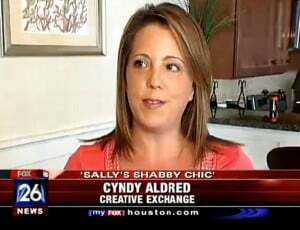 Thanks so much Cyndy- great ideas! This is so great! I was trying to find a creative and inexpensive DIY Xmas project and did thanks to you! I do have a question…I was thinking about magnetized photo frames so they can be put on fridges, in lockers, etc., but most of those use plastic frames instead of glass. Will the primer and chalkboard paint still work on plastic? I love the idea of making them to put on fridges with the magnetized frames. I am not sure if it would work. I would try it but try lightly roughing up the plastic with a very, very fine grade of sand paper before you prime first. If you get an emamel primer that says it works on plastic (I think Rustoleum makes one), that might do the trick! Let me know if you try it! Thanks so much for stopping by! AMAZING idea!!! I am making for Christmas Gifts!! Thanks so much!!! Has anyone got a good idea on how to incorporate in the chalk and mini eraser, so it will be handy on the board? If used as msg board, I want the chalk to be attached somehow…any ideas? I haven’t thought of a way to incorporate chalk and mini eraser but I was thinking something on the back of course. You could attach one of those command hooks and put the chalk and mini eraser in an inexpensive mini mesh jewelry bag and hook? Let me know if you all think of anything else! I saw an idea on Pinterest for including a chalk holder out of an upside down drawer pull. 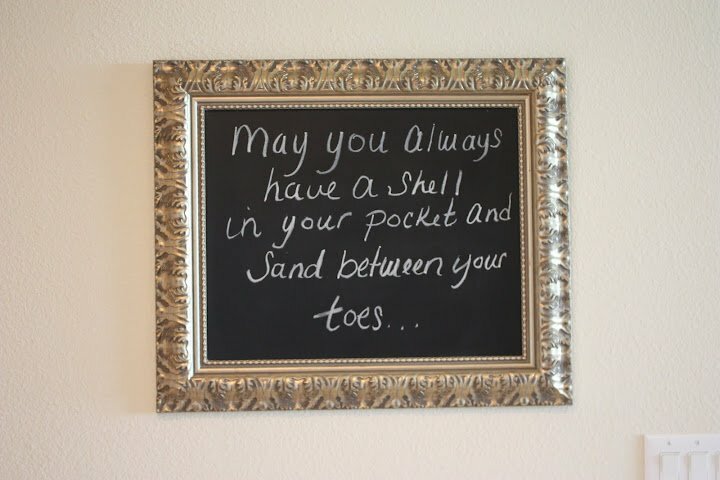 I love this idea….I believe someone will be getting some of these for Christmas gifts as well. Now on the hunt for some unusual looking frames. Thanks! You could use those little Scrabble tile holders to glue to the board to hold the chalk and a slim eraser. It would look cute; now to find some Goodwill Scrabble games for the holders! I was wondering if chalk spray paint would work or if it is not as nice as the paint? You know, I was just looking for good instructions on how to get a smooth surface with chalkboard paint. I am SO glad I clicked on the link to this site! My wife and our two children are out of town and was planning to surprise the kids with a chalkboard on the kitchen island. Now I can also surprise my wife with some chalkboard frames. Great site and great project – thank you!!! I did mine today!! Can’t wait to write on it tomorrow! This was a wonderful idea! I made this today and I can’t wait to write on it tomorrow!! This was a great idea, thanks so much for sharing!!! I just love this! Thank you for sharing an obvious talent and gift with the rest of us! Love this idea! I am using this for my wedding for the menu, table seating, etc. What is a great chalk to use? I don’t want it to be too dusty, but still erasable if I mess up…does liquid chalk work? Artist pastels? chalk marker? Suggestions would be much appreciated! Cheers! wow. you just saved me some serious time and energy. i just purchased and painted several very large, old frames and planned to custom cut backs for chalkboards… instead, i’ll just start priming that glass tomorrow! glad the post was still here to find! thanks! Is it really necessary to apply the primer before the paint? Or can it work with just the chalkboard paint? I did this last night after finding this on Pinterest, I was so excited not to have to find some sort of board to fit in the frame. I used primer, then used spray chalkboard paint after a couple of hours. I checked on the glass this morning, it looked fantastic! So smooth and clean looking! I’m sooo excited to put it back in the frame and use it. I want to make another but I don’t really have use for another, maybe a gift for someone. Thanks for the great idea! I’ve always wanted to make one of these & decided to follow your instructions. However, i think i’ve made a mistake by buying the Valspar Chalk Board spray paint instead of the container. I don’t think it will turn out nicely at all, it looks uneven now. Can i just buy the container & paint it over the already painted one or do i have to start all over? Thanks. Chalk board paint (both spray and container) go on real uneven but dry smooth. Let it dry overnight and then try a second coat. I think you should be ok. If not, lightly sand whatever you have and switch to the container. I would love for you to come back and tell me how it worked for future reference! Thanks Tavia! Oh this one is already dry & it still has large patches of the look of sand paper (just a rubber feel when you touch it). It’s just bad. I already got the can instead, i don’t have any sand paper at the moment (new to the diy home improvements) but will give it a try anyway & will let you know. Turns out i had to start all over on the opposite surface & painted 4 layers of chalkboard, but i had success! In any case I’ll be subscribing to your feed and I’m hoping you write again soon! Here is my DIY chalkboard – I love how it turned out!! After you are finished with the project, is it necessary to prime the chalkboard by rubbing chalk (lengthwise) on the board and erasing it before writing on it? I had read to do this on a chalkboard that you buy and it will make future erasures easier and keep the first thing you write from showing permanently on your board. I wasn’t sure if this step applied to chalkboard paint as well?